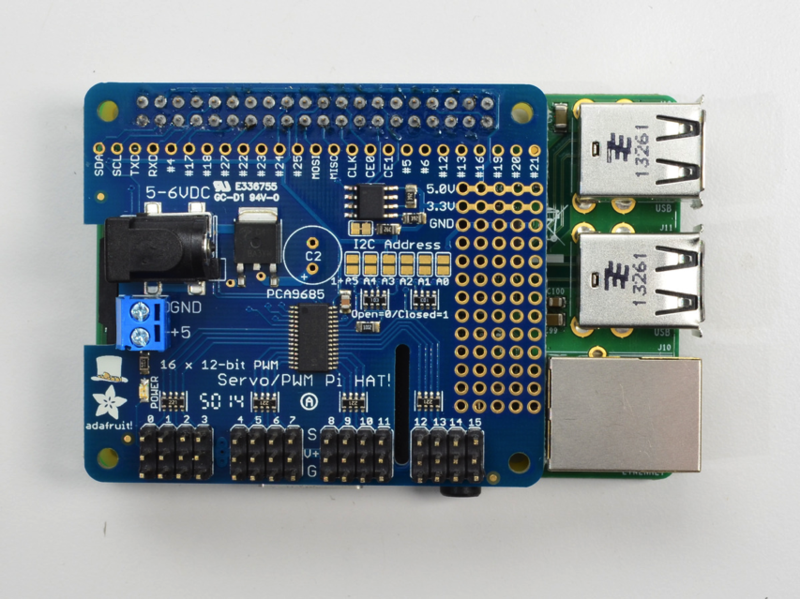 NEW PRODUCT – Adafruit 16-Channel PWM / Servo HAT for Raspberry Pi – Mini Kit « Adafruit Industries – Makers, hackers, artists, designers and engineers! For use with Raspberry Pi Model A+ or B+, can be used with the Model A or B if you use a tall 2×13 header instead of the included 2×20. 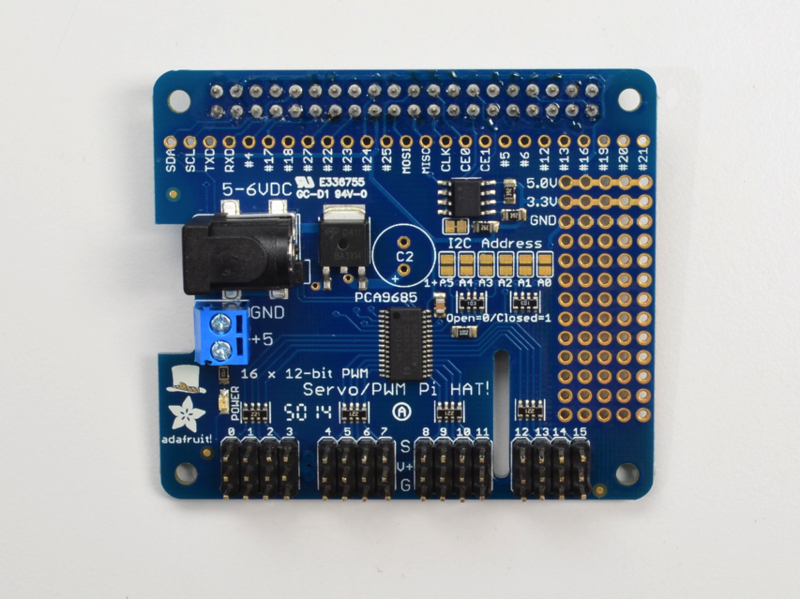 The Adafruit 16-Channel 12-bit PWM/Servo HAT will drive up to 16 servos or PWM outputs over I2C with only 2 pins. 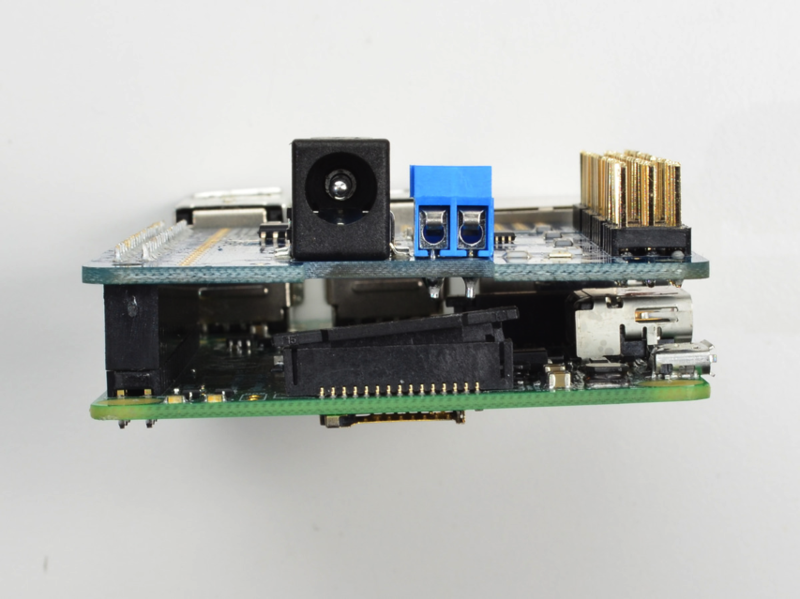 The on-board PWM controller will drive all 16 channels simultaneously with no additional Raspberry Pi processing overhead. 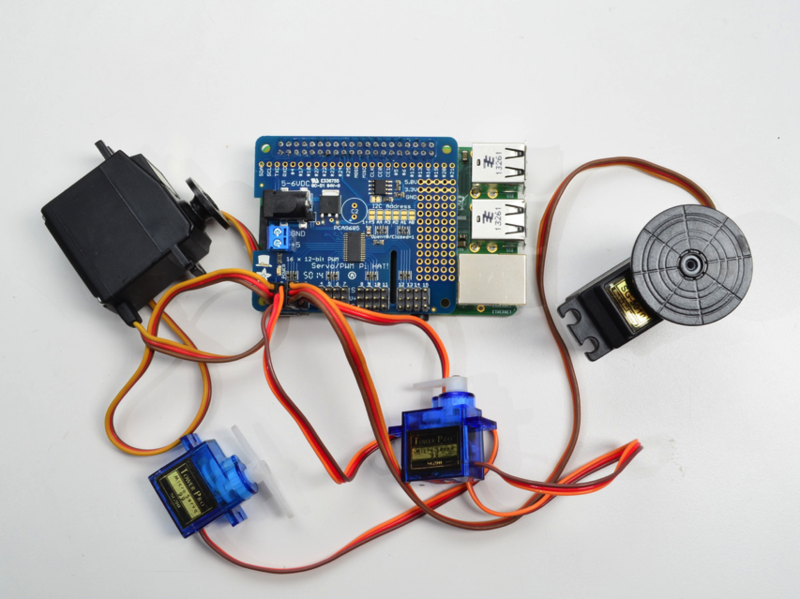 What’s more, you can stack up to 62 of them to control up to 992 servos – all with the same 2 pins! Best of all, we even have a Python library you can use, so you’ll be up and running instantly, to make your robotic creation com to life. 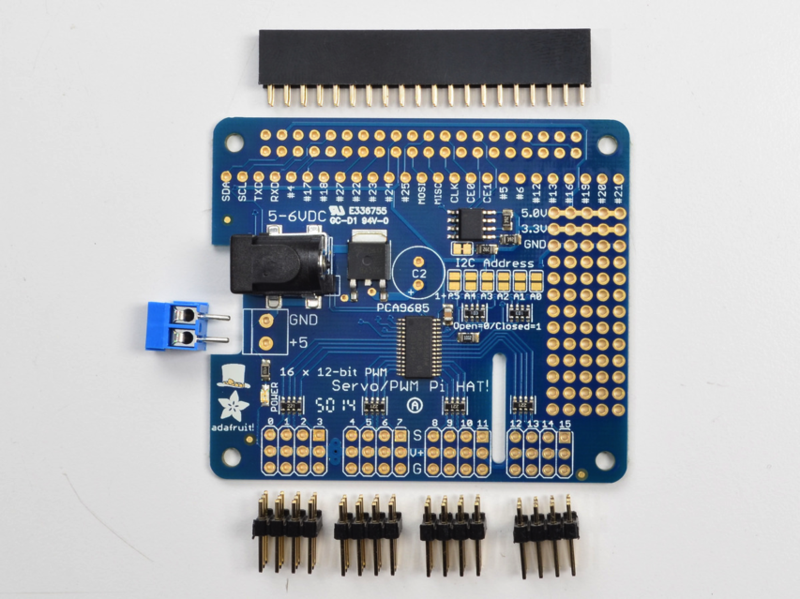 The Adafruit PWM/Servo HAT is the perfect solution for any project that requires a lot of servos or PWM outputs! Please check out our detailed tutorial for lots more information including diagrams, schematics, installation instructions and more. 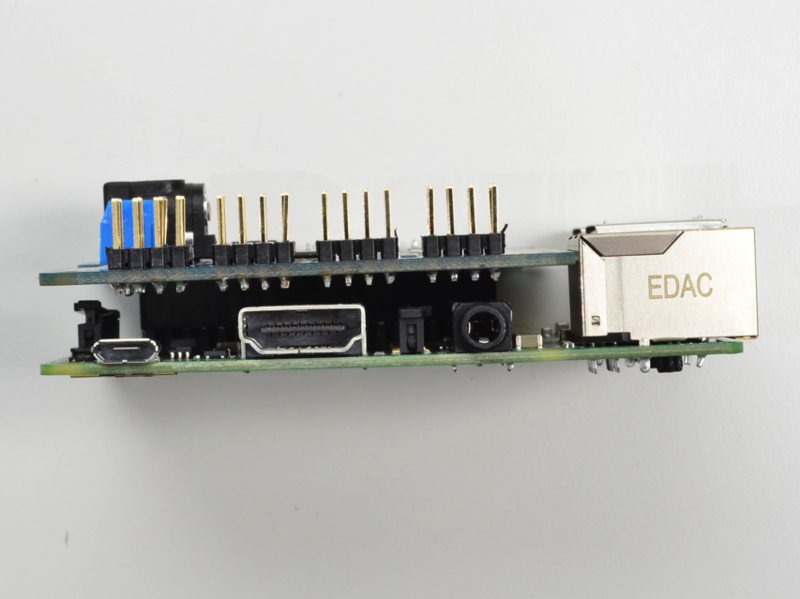 Each order comes with a Servo HAT, a 2-pin terminal block, four 3×4 headers and a 2×20 socket header. You’ll need to do some light through-hole soldering to attach the headers onto the HAT circuit board, but its easy to do with basic soldering tools like a soldering iron and rosin core electronics solder. If you would like to stack multiple HATs onto one Pi, you can also pick up a 2×20 stacking header and a set of right-angle 3×4 headers that should be soldered on instead.